Chennai: The fire that burnt down a textile showroom in Chennai has been extinguished and work to demolish the building housing it is expected to commence soon, as a top central portion collapsed today. Tamil Nadu Finance Minister D Jayakumar told reporters that the building will be manually demolished within three days as it has no structural stability. The demolition work will begin soon, he said. Although the building could be demolished within seconds using modern technology, it could not be considered in view of the structure being located in a key commercial area in corporation limits, he said. Fire and Rescue Services office said the fire has been put out now. However, as a precaution fire tenders have been stationed there. 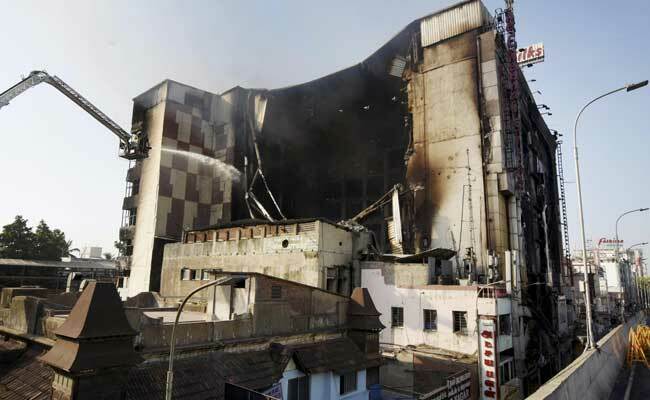 Twelve persons were rescued from the seven storied building, which houses Chennai Silks, a leading textile showroom on the busy Usman Road, when the fire broke out at about 4 am yesterday. Tamil Nadu Revenue Minister R B Udhaya Kumar said a portion of the building collapsed today due to the heat produced by the blaze and the particular stretch had no supporting pillars and it looked like a conference hall. He said a team, comprising top government officials and experts including one from the IIT Madras have begun assessing the fire ravaged building since morning. Speaking to reporters after inspecting the structure, he said the next step for the government was to "remove the building without causing any disturbance to commercial and residential buildings in the vicinity." Stating that preliminary assessment showed that "pillars were strong and brick walls have cracked," he said there were several technical methods to bring down the structure. Lauding fire fighters for putting out the fire risking their lives, he said there was no loss of life due to efforts including declaration of the area as out of bounds for public. He said the mishap was a "lesson in safety" for all. About violations in the building construction, the minister said corporation officials were scrutinising it. Appropriate action will be initiated if warranted, he added. On demolition work, a senior official said rubble will be deposited in the rear of the building creating a platform for the "jaw crusher," a machinery that will aide the demolition. About three years ago, the T Nagar Residents Welfare Association had approached the Madras High Court over alleged violations in a section of buildings and lack of fire safety mechanism in the neighbourhood. Secretary, TNRWA, B Kannan told PTI that the mishap proved yet again the acute need to ensure fire safety. He said the petition was before the court and the government had sought time in the matter.